Ok. Starting issue and fuel filter issue solved. Got everything timed correctly and replaced all return line components as well as injector crush washers. Got it primed and had to replace an injector that was leaking. Now truck starts and runs but runs rough and smokes like a train when holding steady throttle. Could this be pump timing advanced or possibly water getting into oil or intake? Only thing I removed beside ip and Lp was water pump. Is that the orriginal IP, or did you replace it? I lost track. The radiator pushing fluid out, as it warms up and with the cap off is pretty much normal, at least from what I've seen on the stuff I've worked on. I don't see any bubbles in it. The smoke and rough running could be from a number of things. What does it do when it increases in RPM? What does it idle like? Does the smoke smell like fuel? I had an advance piston in the IP stick once, it ran sort of like that. Mine ran good at high rpm and under load, but would smoke like it was fogging for mosquitoes at lower RPMs, idle, and coming down from high RPMs. You pulled the timing gear out, How did you line everything back up? There are some write-ups on this forum that describe how to do it without pulling the front of the engine off, but I don't think I would trust them, I would still need to see the marks just to be sure they are right. Ip is original . I pulled the number one glow plug and bumped the engine over until I got the compression stroke. Used a compression tester for this. Bumped it 2 more times after compression to get marks straight up and down. Radiator pic was to show oil in water. Truck barely smokes when idling but very hard to start. The pic of smoke is around 2k rpm. 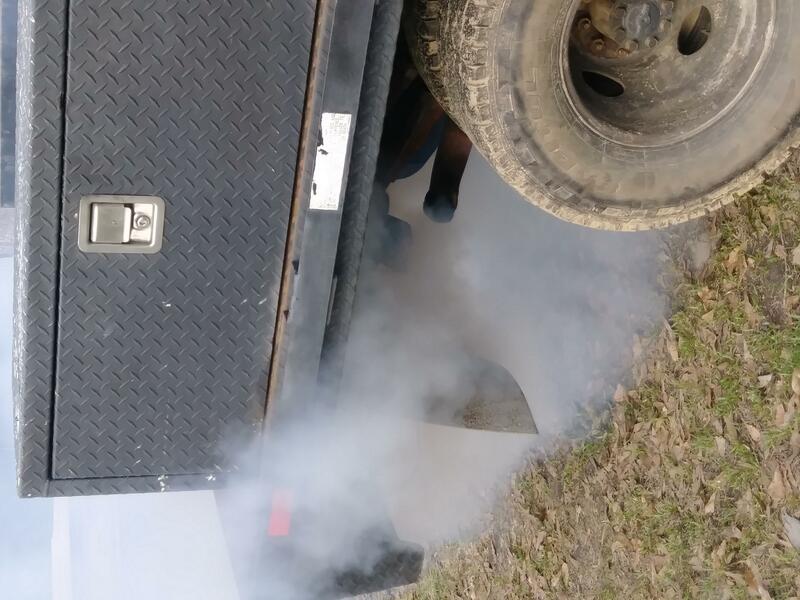 When I first started the truck it was definitely fuel smoke I added water to radiator and smoke got worse. The truck only ran maybe 2 mins before I added water no long enough to overheat anything. Pump timing maybe advanced a tad but its very close. I also don't see any bubbles but I would look closely to be sure you don't have cavitation. 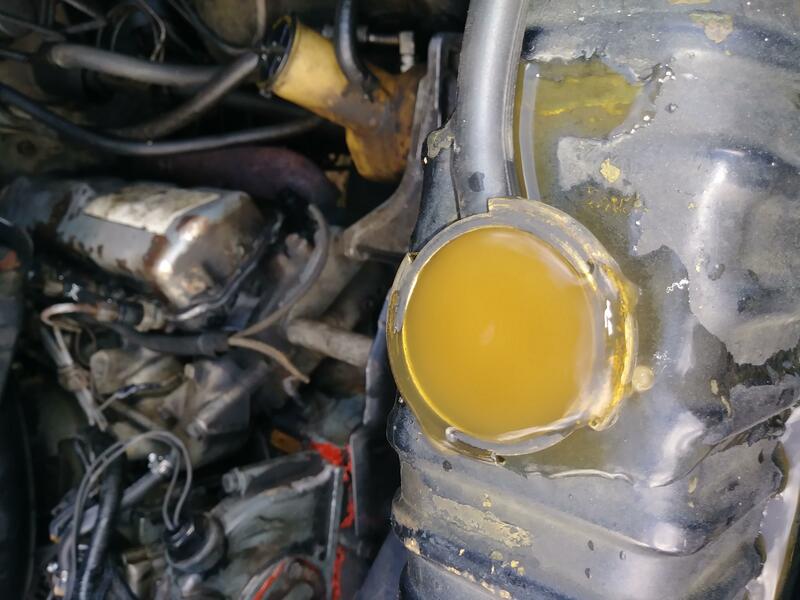 Ive never seen orange coolant.... But then again I'm from Canada. (1xGen 3 alternator) + high idle mod 1200rpm. You don't "see" cavitation unless you have a bare block and spot the tiny holes in the cylinder walls. OK, you did good getting the #1 piston to TDC on the compression stroke, but why did you turn the engine over two more times ? It's impossible to see the marks unless you have the whole front cover OFF. The Y mark on the IP gear has to line up (Match) the Y mark on the Cam gear. Once you have the #1 piston to TDC on the compression stroke, you have to move the damper pulley MARK to line up exactly in line with theO on the timing tab. Use a 15/16" socket and short extension on the damper pulley bolt to rock the engine back and forth to get the damper pulley MARK to line up with the O. DO NOT TURN THE ENGINE OVER WITH THE STARTER AGAIN. Now with a marker pen, draw a line straight up and down from the Y mark, now count 17 teeth on each side of the mark and mark them, now draw a line across from them, now drop the gear in so the line is in line to the engine, the Y mark should be facing down, now put the IP gear cover ON, then install the IP, the dowel pin will put the IP in a static timing position, from there the IP should be timed with the proper equipment. If you didn't line up the timing marks, it won'trun worth a crap. It isn't like cold timing an old distributor, You have no idea when the IP is going to send its fuel shot to the cylinder, as you would when watching the ignition points in a distributor. That is why you need to line the marks up by the fatory marks on the gear. The best way to do that is to pull the front off of the engine, and visually make sure they are lined up correctly. There are other ways, but that is the only way that I would trust.